In 2011, nature photographer David Slater was shooting in North Sulawesi Indonesia, when his was camera stolen by a female crested black Macaque monkey. Curious about the seemingly bizarre contraption, the primate began pushing buttons, accidentally taking a series of selfies. Slater posted the photos on his social media only to find that they were quickly copied and posted throughout the web, including articles about the monkey selfies. Slater was not happy and began sending takedown notices to man of the alleged infringers. However, many of those takedowns were ignored responding to Slater that since he was not the one who took the photos, then he was not the copyright holder and so had no right to request removal. In that article, we argued that Slater nor the Macaque held the copyright to the Macaque’s selfie, relegated the images to the public domain for anyone to use; an analysis that apparently neither Slater or PETA found compelling. Now PETA, in a bizarre twist of copyright law, has filed a copyright infringement lawsuit against Slater on behalf of the Macaque, named Naruto. PETA claims that Slater’s self-published book, with a monkey selfie cover photos, were used without the Macaques’ permission. According to PETA, Naruto has the rights of a copyright holder: the exclusive right to copy, distribute, and publicly display the images. Therefore, Naruto is entitled to any profits derived from her photos. In this case, because the Macaque selfie is the cover shot, PETA believes it is the primary reason anyone would buy the book and so the majority of the book’s profits, along with any profits from selling individual photos, should be Naruto’s. PETA says proceeds from the suit, as well as future profits from the pictures, will be used to care for Naruto and his primate community at the reserve where they live. According to PETA’s complaint, U.S. copyright law never explicitly states that an “author” must be human: “While the claim of authorship by species other than Homo sapiens may be novel, ‘authorship’ under the Copyright Act of 1976, 17 U.S.C. § 101 et seq. is sufficiently broad so as to permit the protections of the law to extend to any original work, including those created by Naruto.” On the one hand, that is true. There is no mention of human authorship in the Copyright Act, however, after the last uproar, the Copyright Office weighed in on the issue in their Compendium II of Copyright Office Practices stating that the Copyright Office would not register works created by animals or through the forces of nature. It goes on to specifically mention a “photograph taken by a monkey,” as an example. To be fair, a rule on Copyright Office practices is not the law. Registration is not even required to hold a copyright. Copyright is automatic. However, from a practical point of view, it becomes a de facto law since it would be highly unlikely for any U.S. court to disregard the Copyright Office on this issue. In fact, initiating a copyright lawsuit in the United States requires registration with the Copyright Office, so without the Copyright Office providing that registration, a copyright infringement suit could not even commence. If Naruto were a U.S citizen, that would be the end of the case but Naruto is not a U.S. national so, under the Copyright Act, a U.S. copyright infringement lawsuit does not require registration before filing. That gets PETA and Naruto past the first hurdle, but they still have to show that Naruto holds the copyright. As evidence against that claim, the courts will likely defer to the Copyright Office rule, which will be hard to get around. Not only does PETA seem to ignore the rule, but Slater still claims he holds the copyrights. Along with his book, Slater has been selling signed prints on his website. There is, of course, nothing wrong with that. As public domain images, he is perfectly free to profit from them, and he is still the only one who holds the original untouched digital files. Slater can claim ownership and regardless of his claim, won’t affect his ability to sell the monkey selfie. Why Does the Copyright Office Believe the Monkey Selfie Does Not have a Copyright? Therefore, for creative work to receive copyright protection, it must be “original,” a “work of authorship,” and “fixed in a tangible medium of expression.” There is no argument that the work is fixed in a tangible medium. As soon as the camera sensor recorded the photo, it was fixed in a tangible medium. However, is it an original work of authorship? Ellen DeGeneres wanted to beat the all-time record for re-tweets by gathering a gaggle of actors and actresses for a group selfie. Her camera required some distance to encompass the whole group of actors, so Ellen handed the camera off to Bradley Cooper, who by virtue of being at the front, and having longer arms than Ellen, took the iconic photo. Who held the copyright, Ellen or Bradley Cooper? Bradley Cooper took the photo. He translated the idea into the tangible medium of expression and should be the copyright holder. On the other hand, Ellen did direct him to take the shot and set up the photo shoot. In Copper and Degeneres’ industry, creative direction is frequently doled out to camera operators and directors are often considered authors so an argument could be made that Ellen holds the copyright. Slater, however, gave Naruto no direction. 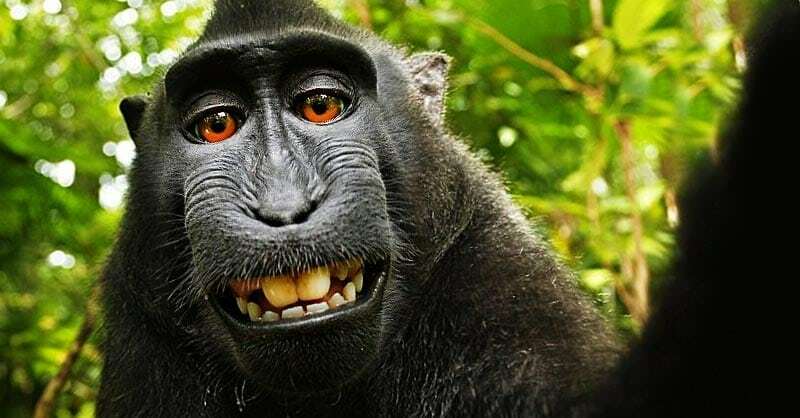 Had Slater purposefully set up a situation in which Macaques or other primates could use cameras to take selfies, then there might be an argument that he is the author of the monkey selfie and should hold the copyright. However, Slater merely owned the equipment that Naruto stole, The fact that Slater owned the equipment, as well as the physical image files, is not enough for him to claim copyright in those photos. Is Naruto the author then, holding the copyright as PETA suggests? Perhaps, if it were not for one other limit on copyright: originality. Case law has defined a work as “original” when it is created independently and evinces a “modicum of creativity.” Creativity is the important factor. Not everything created is copyrightable. Headlines, facts, slogans, names and titles, and short phrases don’t have the level of creativity required to receive copyright protection, (although jokes may have copyright protection, and Twitter has tried to protect tweets). For example, One of William Faulkner’s most famous lines is “The past is never dead. It’s not even past.” In the Woody Allen film, Midnight in Paris, Owen Wilson’ character paraphrases the line saying, “The past is not dead. Actually, it’s not even past. You know who said that? . . . Faulkner. And he was right. And I met him, too. I ran into him at a dinner party.” The Falkner Estate sued Woody Allen for copyright infringement. Despite line being so well known, the court dismissed the case concluding that the short phrase did not rise to the level of creativity required for copyright protection. Does Naruto’s work have as much creativity as Willaim Falkner’s short phrase? Is ti any more creative than accidentally dropping a camera causing it to fire or accidentally knocking over a paint can onto a canvas? The Copyright Office says no. While some people might say that Macaques and other primates are creative, the consensus among lawmakers is that animals cannot create original works, only accidental ones. (see the Humane Society’s Chimpanzee Art Contest). Naruto did not know she was taking selfies or that she was even holding a camera that could generate photos. She just stole the camera to examine or play with it. Macaques, after all, are well-known thieves. They have one of the largest brains of all primates with sophisticated hand to eye coordination and the ability to control their hands and fingers much like humans. Macaques are adept thieves, stealing everything from ice cream out of the hand of children to stealing food from refrigerators in people’s homes. Thievery is not purely a learned behavior occurring within Macaque troops. Male Macaques have even been known to kidnap infants monkeys, holding them for ransom to gain a higher social status. It would be difficult to convince a court that Naruto’s selfies were anything more than the accidental product of thievery and curiosity and without the creative spark, the monkey selfie is not copyrightable subject matter. If the case has so little merit, then why did PETA feel the lawsuit was a good idea? More than likely, it is political, or merely free publicity. The lawsuit is one in a line of unsuccessful bids to give personhood to animals as an attempt to limit animal testing and remove animals from captivity. Animal personhood cases are not fairing well, although not for lack of trying. Slate Magazine discusses two recent cases that ended in failure: “This year, a state court judge in New York rejected a suit seeking a writ of habeas corpus that would have freed two chimps from a research laboratory in New York on the theory that they were wrongfully imprisoned. PETA itself brought an unsuccessful case against SeaWorld claiming that the company was violating the 13th Amendment’s prohibition against slavery by keeping orcas in captivity (a judge swiftly concluded that the amendment was, as most of us assumed, meant to apply to humans only).” Don’t expect PETA to stop this approach anytime soon, not with all the Press this case has gotten. While this lawsuit is almost sure to fail, PETA must feel that animal personhood cases are a win regardless of the outcome. However, several activist have expressed worry that these frivolous lawsuits might hurt their cause. Internet shaming over ridiculous tactics is real and should be considered, but whether the suit will create a backlash remains to be seen. However, given that the PETA lawsuit goes after David Slater, an unpopular internet character due to his excessive use of takedown requests for websites showing the monkey selfie, PETA is probably safe on this one. This is an excellent analysis of the monkey selfie question. Thanks. How about standing? Does PETA have standing to sue on behalf of an animal in general, or one that lives in another country in specific? And how do Federal judges react in general to parties who file lawsuits mainly for publicity? Do courts award attorney fees to the losing party in these types of cases? Lots of issues! That is a really good question. The Complaint first asks the court to allow the Money the right to sue for his copyright, then if they agree that she can, it then requests that the court allow PETA to administer the copyright on the monkey’s behalf. It is so unlikely and convoluted that it only adds to the whole thing being a PR stunt, unless the judge is an animal activist and allows it. But then it would probably fail on appeal.